Epidemiology, classification and diagnostic criteria of Diabetes Mellitus. Clinical Presentation of diabetes mellitus. Type 1 diabetes. Type 2 diabetes. Acute and chronic complications of Diabetes mellitus. Pathophysiology of diabetic retinopathy. Clinical features of diabetic retinopathy. Management of diabetic retinopathy and maculopathy. 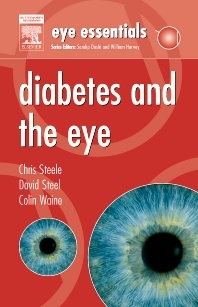 Co-existing eye disease with diabetic retinopathy. Preventing diabetic retinopathy through control of systemic factors. This title is directed primarily towards health care professionals outside of the United States. Eye Essentials is a major series which provides authoritative and accessible information for all eye care professionals, whether in training or in practice. Each book is a rapid revision aid for students taking higher professional qualifications and a handy clinical reference guide for practitioners in busy clinics. Highly designed with synoptic text, handy tables, key bullet points, summaries, icons and stunning full colour illustrations, the books have rapidly established themselves as the essential eye clinic pocket books.